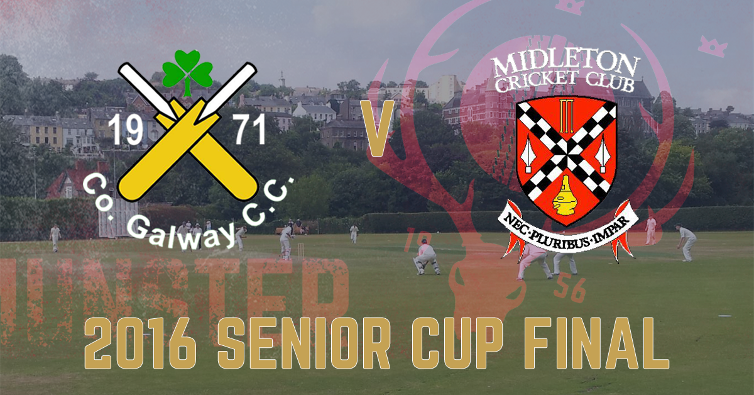 The 2016 Munster Senior Cup Final sees County Galway Cricket Club take on Midleton Cricket Club at the Mardyke in Cork. It will be Galway's second final in three years after they last won the Cup in 2014 while Midleton will be making their first Cup Final appearance since 2003. The second Semi-Final saw Midleton take on County Kerry at Town Park. Midleton reached their first Munster Senior Cup Final since 2003 thanks to an incredible team effort against a spirited County Kerry side in a game that saw almost 500 runs scored in a perfect cricket conditions. Midleton reached 257-7 thanks to contributions from Rob Smyth (61), Kieran O'Reilly (45) and Jeff Hitchmough (27). Tight bowling, particularly from Magid Sharif, and heroic ﬁelding from Midleton won the day with County Kerry finishing on 235 all out. The action kicks off at 12 noon so be sure to make it down to the Mardyke for Munster Cricket's showpiece fixture.